High-tech software and services companies have been some of the biggest employers in the United States, growing at an annual rate of 5 percent since 2010. This job growth has translated into strong leasing activity in the top 30 metropolitan markets for tech in both the U.S. and in Canada. Seattle, San Francisco, Montreal and Toronto still rank among the top 10, but a new crop of emergent North American markets for office space are drawing interest from tech firms and investors alike, thanks to its attractive combination of low office rents and a growing labor pool for tech talent. These markets include Colorado Springs, Milwaukee, Miami, Kansas City and Ottawa. Technology-dependent industries in the Milwaukee region contributed $27.6 billion in regional economic impact in 2017, nearly one quarter of the total regional economic output in the market, according to “Milwaukee’s Tech Talent Impact Study,” a report conducted by TIP Strategies, an economic development consulting firm. 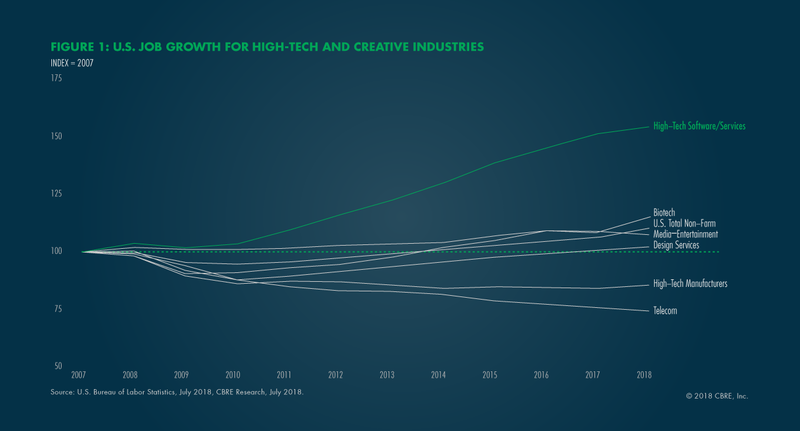 “As tech firms seek innovative and creative cultures to attract and retain talent, they are expanding into secondary and tertiary markets,” per CBRE Research. These emergent markets also boast relatively affordable rents. In Milwaukee, the average asking office space rent is $18.65 per square foot, as compared to $34.97 per square foot in Seattle, the top market in the Tech-30 report. Both [Madison and Wisconsin] are very attractive places to live, and have good university systems and cost structure. Ottawa, which ranked second in the 2018 CBRE Scoring Canadian Tech Talent report, boasts an 11.2 percent concentration of tech workers, ranking it well above the Canadian average of 5.3 percent. While Ottawa ranks as the Canadian market with the highest average tech wage, when converted to U.S. dollars it still ranks as being more affordable that the lowest-cost city and offers a similar quality rating, per the CBRE Scoring Canadian Tech Talent. “With several cities presenting excellent or very high quality labor at a less prohibitive cost, Canadian cities often come out ahead in this respect,” per the report. A tight labor supply and sustained demand for technical skills from other industries resulted in slower annualized job growth of 4.1 percent in 2018 vs. 2017, although still roughly twice the national average, per CBRE Research. But future growth faces a structural barrier due to a shallow pool of available talent for high-skilled jobs like software development. High-tech companies have to compete with other industries for top tech talent. 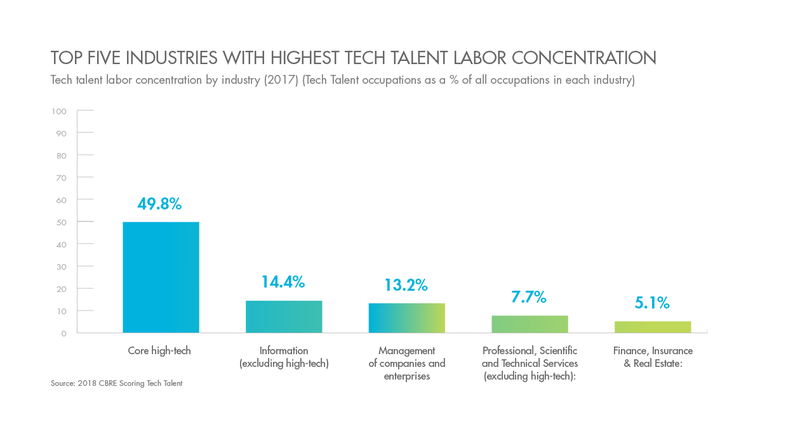 An estimated 37 percent of all tech workers are employed in the high-tech industry, with other industries employing the remaining 63 percent, per CBRE’s 2018 Scoring Tech Talent report. A low unemployment rate for college-educated workers is only adding to the talent crunch, although CBRE Research sees this improving in the next few years thanks to a 53 percent increase in college graduates with high-tech degrees over the past five years, with 292,000 new tech graduates in 2017. From 2016 to 2017, markets like Seattle Montreal, and St. Louis experienced the largest high-tech job growth, outperforming national averages. Despite the tighter job market for high-skilled tech workers, U.S. office leasing activity remained strong. In the first half of 2018, high-tech companies accounted for 21 percent of all U.S. major office leasing activity, compared with 18 percent in 2016, per CBRE Research. From 2016 to 2017, markets like Seattle Montreal, and St. Louis experienced the largest high-tech job growth, outperforming national averages. All markets in the Top Tech-30 report experienced increased net absorption and a low level of available space for sublease, which CBRE Research sees as strong indications of strengthening market conditions in the future. By expanding into new markets like Milwaukee and Ottawa, high-tech companies can “access more tech talent and create a more geographically distributed workforce,” per CBRE Research.